Valentine's Day Promo is now over. Valentine's Day is the day for lovers. But 24 hours is never enough time to celebrate the relationships you've built with your favorite models. Starting at midnight (EST) on February 9th, you'll have 6 full days to shower your special someone with love during the 2019 Valentine's Day Celebration. We've added Candy Hearts inscribed with sweet and tender nothings to your tip bar. Read on to see all the ways you can cherish one another during the sexiest time of year! The 10 performers who collect the highest total number of Candy Hearts will win a cash prize depending on where they place. The 1st place through 5th place winners for each contest will win the following prize amounts respectively: $1500, $1000, $500, $300, $200 and the 6th place through 10th place winner will win $100 each. The 10 performers who collect Candy Hearts from the highest number of unique users will win a cash prize depending on where they place. on being crowned the Queen of Valentines for collecting 9,340 hearts! Enjoy your special badge! From midnight (12AM EST) on Friday, February 9th, through midnight on February 14th, our models will compete to collect the most Candy Hearts from you, their fans. Flood their boxes with sweet lovin' and help them win a big cash prize. There are 21 different Candy Hearts to pick from, priced at 40 credits for VIPs and 50 credits for all other users. You can send them one at a time, in a candy box of 7 (see sidebar for details) or in a custom quantity of your own choosing. There are 2 different ways your Valentine can win: Collecting the most Candy Hearts overall, and collecting the most Candy Hearts from unique users. Love is a 2-way street. While you're showing your favorite models how much you care during the Valentine's Celebration, they'll send you some love in return. If you're sweet enough, you have the chance to win more than just their affection! Collect Valentine Hearts from as many guys/girls as you can! When the competition ends, the customer who has received hearts from the most unique models will win $500 in free credits! To receive a Valentine Heart, you must have credits in your account. There's no charge for models to send them, or for you to receive them. However, the model may ask you to carry out a forfeit in return. for receiving Valentine Hearts from the most models! We're making the Valentine's Day Celebration extra-sweet today! Models who earn 5,000 credits while competing for your Candy Hearts automatically enter our Day 3 random draw for a daily cash prize. The first 20 winners drawn get a $100 bonus, and the next 20 win $50. So log in now and shower your special guy in Candy Hearts as the season of love continues! Throughout the Valentine's Celebration, our models will offer special scheduled shows in honor of the sexiest day of the year! Expect to see hearts, halos and tons of red lace as our amazing cam girls celebrate the season of love! Each model has a Candy Hearts Counter next to the gifting tool in their open room so you can see their candy count thus far. Does your special someone need a shot of love? Then shower her with V-day sweets! When you send a full box of 7 Candy Hearts to your favorite model, hearts will magically rain down over the chatroom. When you send a custom number of 8 or more Candy Hearts, the raining heart animation will be accompanied by a special graphic announcing your gift in the chat panel. There's no better way to show your valentine how much love you have to give. How well can you sweet talk a model? In this contest, the customer who collects the most digital hearts from the most models by the end of the contest will win $500, which will be added to their account. Models can give out as many hearts as they want, to as many customers as they like. There is no cost for customers to receive hearts, but customers must have credits in their accounts in order to collect them. The winner is the customer who receives hearts from the highest number of different models. For example, if Joe collects a total of 500 hearts from two models, while Mark collects 100 hearts from fifty different models, Mark will be the winner. In event of a tie (more than one customer collects from the same highest number of models), the customer who has collected the most hearts will win. For example, If the highest number of different models any customer collected from is 100, and Steve has collected 100 hearts from 100 models, while David collected 120 hearts from 100 models, David will be declared the winner. This contest runs from 12:00AM (EST) on Saturday, February 9, 2019 through 11:59PM (EST) on Thursday, February 14, 2019. This contest for models is based on the number of candy heart tips a model receives between 12:00AM(EST) on Saturday, February 9, 2019 and 11:59PM (EST) on Thursday, February 14, 2019. Candy hearts will be added to the tip tool and customers can gift as many candy hearts to as many models as they like, in groups of up to 9,999 candy hearts at a time. Candy hearts are 40 credits each for VIP members and 50 credits each for all other members. 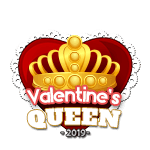 Valentine's Royalty Badge: The top male model and top female model who receive the most candy hearts in the Be Mine Valentine's Day Contest and have actually broadcast for at least 20 hours during the contest period (not including non-show types and members-only shows), will be "crowned" the Valentine King and Valentine Queen, and receive special badges in honor of their newly earned titles. On Monday, February 11, 2019, there will be a random drawing for cash prizes for models. Models who earn at least 5,000 credits on Monday, February 11, 2019, from 12:00AM(EST) to 11:59PM (EST) will be eligible for the drawing. The first ten guys and first ten girls whose names are drawn will win a $100 prize. The next ten guys and next ten girls whose names are drawn will win a $50 prize. There is no limit to the number of prizes a model can win, if he or she meets the requirements for each prize category. A model can win prizes in multiple categories (though only one prize per category). Prizes for all contests that end on February 14, 2019 will be paid out in February. Other contest prizes will be paid like normal promotional prizes when the contest ends. The Flirt4Free Be Mine Valentine's Day contest, and all of its parts, are governed by the laws of the State of California. All federal, state, and local laws and regulations apply. By participating in the contest, models agree to be bound by the contest rules and by VS Media Inc.'s decisions, which are final and binding on all matters pertaining to the contest. We are not responsible for any typographical or other error in the administration of the contest or in the announcement of any prizes.